Come right when they open otherwise you’re in for a long wait. 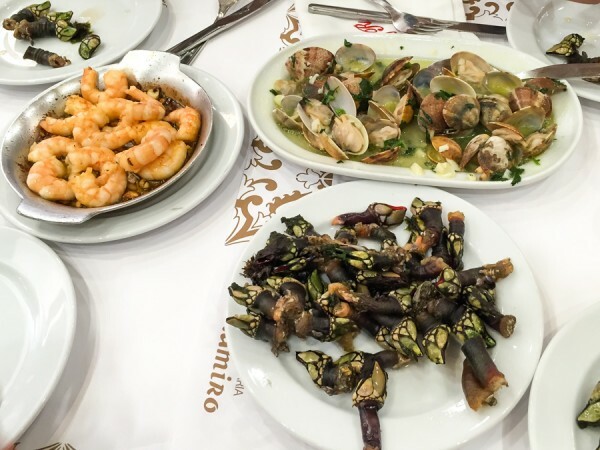 There is a good reason why local chefs and Anthony Bourdain rave about this place, the seafood is unbelievable. 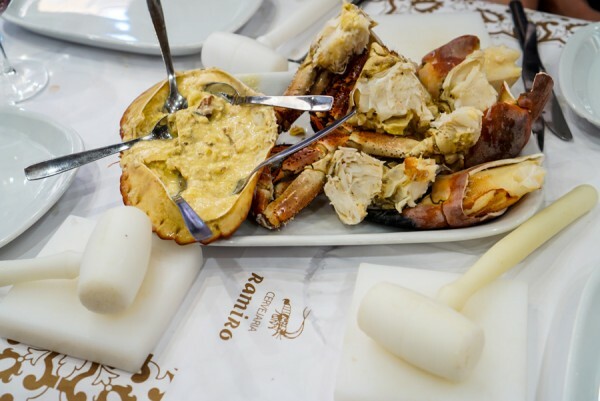 From grilled tiger prawns to clams steamed in garlic butter, crabs and lobsters and so much more. What I love about this place is its a no frills no fuss kind of place. You eat with your hands and the seafood is as fresh as it gets. The crab and all its gut glory is delicious. The shrimp, simply divine. 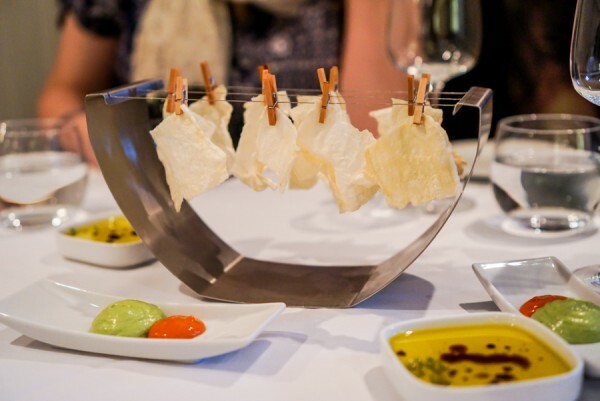 But if you’re adventurous, we suggest ordering the barnacles. Texturally, it’s chewy like snails. Served cold and tastes like the ocean. First one or two is a bit weird, but you’ll find yourself eating more and more. They are quite addicting. It’s our first night in this little boutique city by the ocean and we were on a mission for seafood. 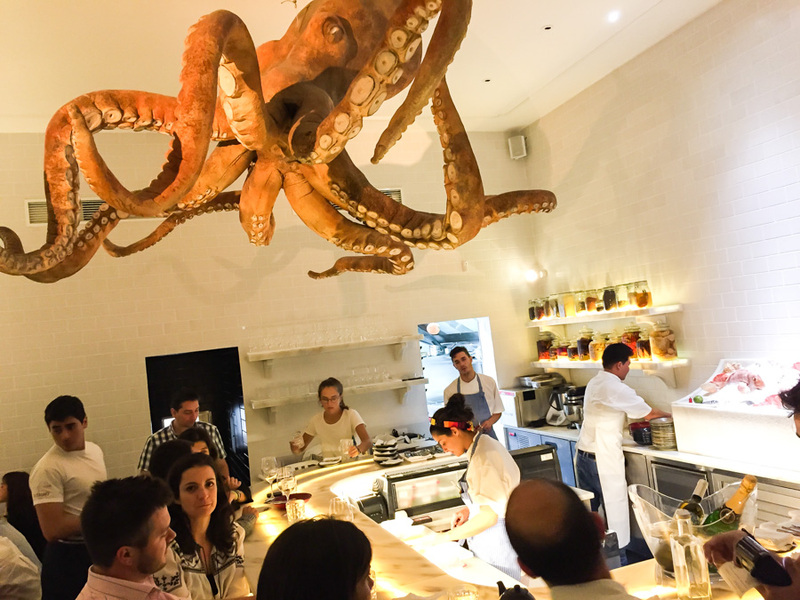 Lucky for us, this modern South American cevicheria is a short 8-minute walk from our hotel and I was practically sold on the giant octopus chandelier hanging from the ceiling. 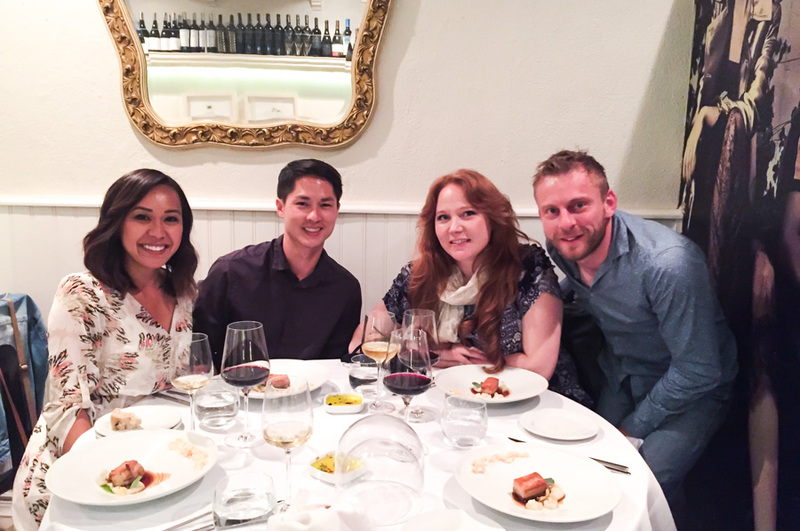 We sat at the counter bar and shared a 4-course set paired with their house white Chardonnay. The caviar and pearls served with chilled gazpacho was by far Q’s favorite while G took a liking to their ceviche. 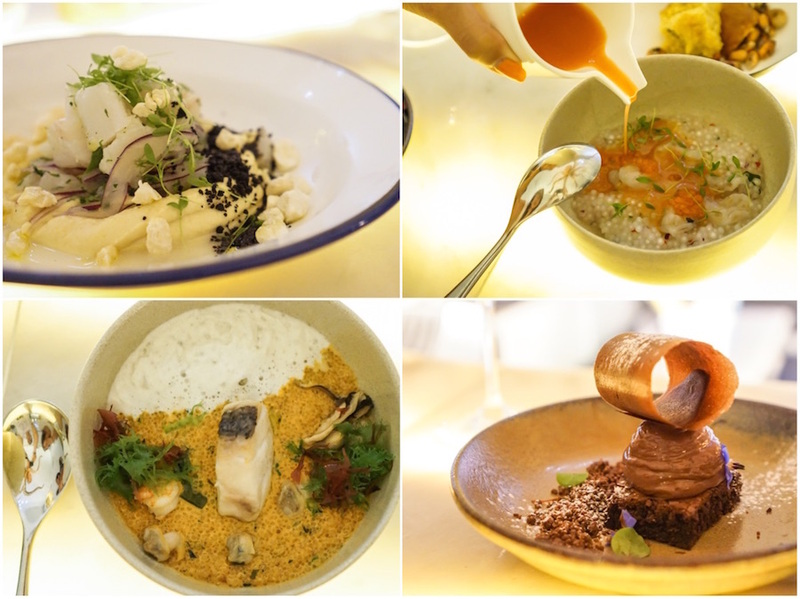 Our last main dish was a seared fish and seafood stew-like concoction. Dessert was a trio of chocolate heaven: chocolate mouse on a chocolate brownie topped with chocolate crumbles and shavings. The portions were medium and honestly, 4-plates was the right amount of food for us. 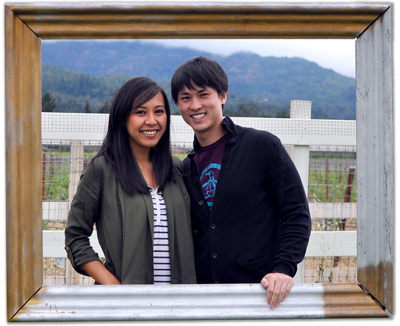 Cool fact: the restaurant founders are a husband/wife couple that traveled around the world for a year and stayed in people’s homes all over the world learning how to cook amazing local dishes from around the globe! Santa Bita was highly recommended by many but the service is extremely slow and the place is small so not ideal for large groups. 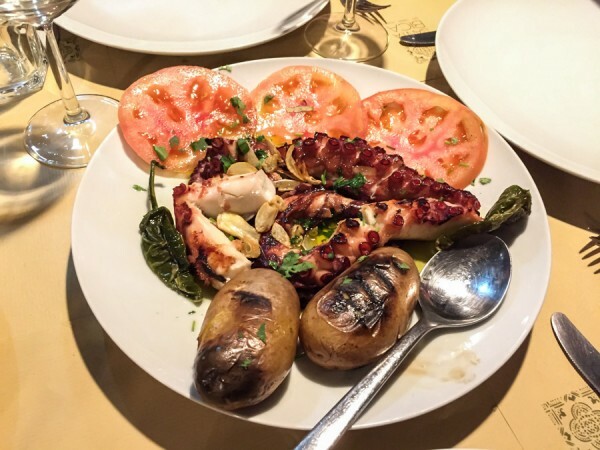 But, it’s in a vibrant neighborhood and the food, once it is served, is good and authentic Portuguese. 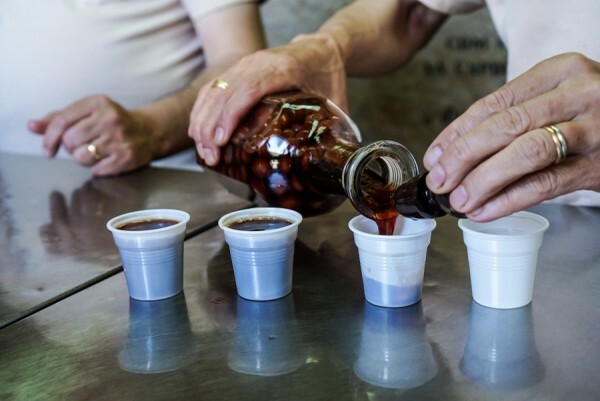 Ginjinha is a local cherry liqueur, often drank in a small shot glass after a meal to help with digestive. It’s an acquired taste, not going to lie. 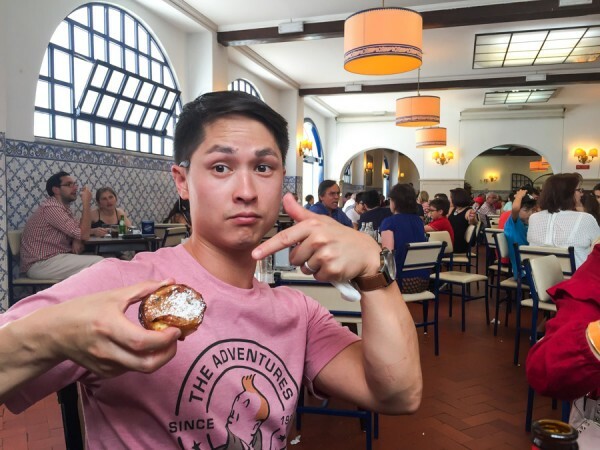 Still worth a shot though — when in Lisbon! 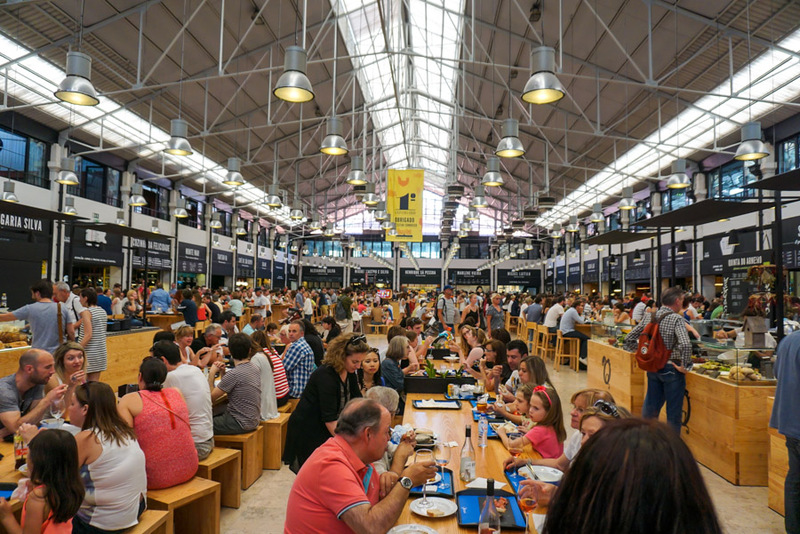 If you can’t make up your mind, the Time Out Mercado da Ribeira is an indoor farmer’s market and there is a trendy food stall area in the back. It’s become a tourist attraction but don’t let that detour you — the food, a bit elevated and posh-y Portuguese favorites, is good. With so many to choose from, thankfully we had our friend Andreia to help us order. We ended up with a tray of assorted small plates: ceviche, fried chicken, octopus and oysters the likes and all chased with ice cold beers! A cool place to people watch and share food among groups. For a midday wine break, because let’s face it, there should always be time set aside for wine breaks, head on over to Barrio Alto where the streets are lined with plentiful restaurants and bars to choose from. Andreia brought us here because we said we wanted to sample Ports. We’ve never taken a liking to Ports back home but figured when in Portugal, why not. 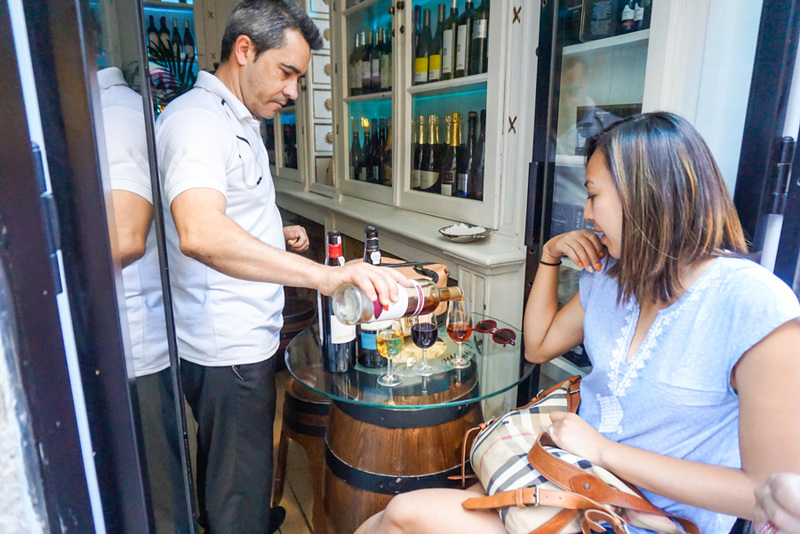 We sampled three different Port wines and they turned out better than expected. We dined here with our Irish friends, whom if you remember, we met a year ago during four honeymoon in Africa. And last but certainly not least, it would not be a trip to Lisbon without having a taste or two (or ten!) 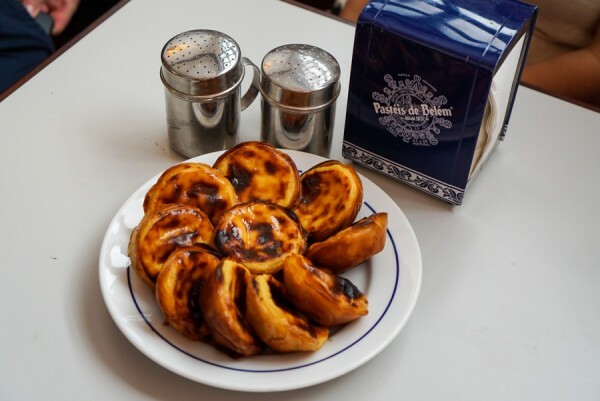 of their famous pasteis de Belem, Portuguese egg tarts. It’s a short tram ride out of town, can usually be done as a half day trip and you should. Trust me when I say, no other pasteis in town could rival the ones from Belem. The tart shell is crispy and flakey, baked to a golden almond-shade of perfection. The custard filling is still has a bounce to it, not at all over-baked. It’s creamy and light but not rich. How can you doubt a recipe that has lasted almost 180+ years? This is unlike the Chinese egg tarts, and quite possibly is one of the best sweet treats we’ve devoured, ever! Don’t forget to top it off with the cinnamon and powdered sugar. 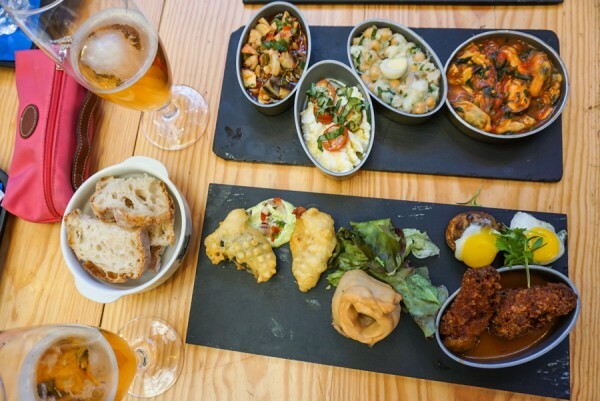 We barely scratched the surface, Lisbon food scene definitely lives up to its hype. What are some of your favorite Lisbon food places? Share them in the comments! A very solid list!! Glad you got to go to Ramiro – have been going there since I was born. Amazing! Well you’ve officially convinced me I need to go to Portugal. I’d been on the fence for years and kind of putting it off but ALL THE SEAFOOD has done it. Nice! Did you try anything different you’d recommend?